Whilst watching the Monaco Grand Prix with rapt attention Badger has also been keeping an eye on other events in the world of racing this weekend. Join us now for our weekend racing digest, where we cover everything from a dramatic final lap of the Indy 500 through to the dramatic final lap of NASCAR’s Cup race in Charlotte. Anyone who saw the closing laps of the Indy 500 can skip this section. Instead, simply recall the drama of that final corner – it was really something. Because in one of the most dramatic finishes in Indy history 23-year-old rookie J.R Hilderbrand was leading on the final lap of the race, seemingly on course to be the prestigious event’s first debut winner in a decade. But it wasn’t to be. Entering the final corner, Hilderbrand was being chased down by Britain’s Dan Wheldon and faced a slowing car on the inside of the track. He got too high in to the marbles and slid in to the wall, wrecking the right hand side of his car with the chequered flag in sight. Wheldon swept through to victory with the rookie’s battered machine limping across the line in second. For Wheldon it was a remarkable second victory in the 500. 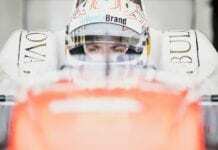 The English-born racer lost his seat at Panther for this year – to be replaced by, you guessed it, Hilderbrand – and was contesting the race on a one-off deal with Bryan Herta Autosports. Despite winning the biggest event of the year and cementing his place as one of the Speedway’s finest competitors in recent years it’s quite possible Dan won’t race again in 2011. If you didn’t catch it, here’s the dramatic final lap. On a weekend that saw Monaco and Indy it would be easy to sweep everything else aside – but we would never do that. In the World Rally Championship Sebastien Loeb took his third win of 2011, strengthening his bid for a ludicrous eighth successive WRC crown. Team-mate Sebastien Ogier had led the Argentine event but rolled his car on Sunday morning, damaging the Citroen and forcing him to limp home third. Ford’s Mikko Hirvonen split the French marque’s drivers. Loeb hasn’t been beaten in Argentina since 2004, and if Ogier continues to throw away safe looking wins he’s likely to extend his unbeaten run in the championship, which stretches back to the same year. He heads the standings on 100 points from Hirvonen (93) and Ogier (81). In Monaco support race news, the battle at the top of the GP2 standings has narrowed to miniscule proportions after an at times chaotic weekend of racing. Pole for the feature race seemed cursed. Giedo van der Garde took P1 in qualy but was then bumped back five places for causing an avoidable collision during the session. That handed the box seat on the grid to Sam Bird, but the Brit bogged down at the start and plummeted to the back of the pack. Second place starter Davide Valsecchi (below) swept through to win with Alvaro Parente second. Charles Pic then did much the same in the sprint, scampering off from pole to take his second win of 2011, with Arden’s Josef Kral an impressive second. But the real winner this weekend was Romain Grosjean, who started the feature race last but climbed an incredible 22 positions on the tight street circuit to take fourth. He backed that up to finish third in teh sprint, rejuvinating his championship bid. And if you’re getting a bit miffed at the lack of a proper title battle in F1 it might be time to turn to GP2 for a real ding-dong for the championship: Grosjean leads with 23, level with Bird, followed by Pic (22), Valsecchi and van der Garde (both on 21). That’s two points between the top five drivers – great stuff. On to Formula Renault 3.5, where Daniel Ricciardo had a very busy but ultimately stellar weekend in the principality. The Red Bull-backed Aussie contested FP1 for Torro Rosso on Thursday before leaping in to his ISR-run FR 3.5 machine. He duly took pole and won the race, igniting his bid for the title he so narrowly missed out on last year. Runner-up spot went to Canada’s Robert Wickens with former Red Bull junior Brendon Hartley third. Frenchman Jean-Eric Vergne failed to score but remains at the top of the standings, just a point clear of team-mate Wickens. Ricciardo is now 29 points shy of top spot in sixth. 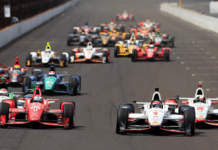 A quick one – Indycar feeder series Indy Lights ran it’s own prestige race, the Freedom 100, during the 500 weekend. American Josef Newgarden took the win ahead of Argentine hotshoe Esteban Guerrieri. This are currently one-two in the championship standings. We close with a bit of NASCAR. The Sprint Cup season rumbled on this weekend, with Sunday’s race holding the same amount of drama as the Indy 500 earlier in the day. In fact, the NASCAR final lap was almost a carbon copy of it’s open-wheeled cousin. Heading into the white-flag lap – that’s the last lap for those outside the Stock Car loop – fan favourite Dale Earnhardt Jr. led with four corners to go. Heading into turn four though, his Chevrolet slowed thanks to running out of fuel a mere 500 yards from the flag. Kevin Harvick blew past to record his third Cup victory of the season and extend Earnhardt’s 104 race wait for a victory, coasting to an eventual 7th place. The night before, Kimi Raikkonen’s foray into America continued with his step up into the NASCAR Nationwide Cup, the second tier of the sport. After finishing 15th in his Truck debut last weekend, the expectation was a bit too much for everyone’s favourite Finn, qualifying a lowly 22nd and finishing – thanks to leaving his pit-box too fast and serving a penalty, damaging the front of his car and even burning his feet in the car! – an even more lowly 27th, four laps down on winner Matt Kenseth. News has reached the Sett that a possible seat at a Sprint Cup team for Sonoma at the end of June may be slipping from his grasp, but at least Kimi has WRC to fall back on, starting with the Rally Acropolis in Greece. Hungarian GP: Top Dog! – YOU decide!